This review is a little different, as I do not have the actual book in front of me as I'm writing up this post. We had just received this book for review shortly before The Great Smoke Out and so it is currently packed away being cleaned. I'm writing based on memory. My memory of Big Book of Wild Animals though is perfectly lovely. This book really is terribly awesome. (Can you use the words 'terribly' and 'awesome' right next to one another?) I accepted this review on behalf of our resident animal lover, Bookworm1. To say that he was delighted with it is a complete understatement. Big Book of Wild Animals is full of fun animal facts and photographs. I loved it because each page deals with a different animal and there is a large photograph picturing the animal being discussed. If you have spent as much time looking through various animal encyclopedias as I have, trying to find one suitable for a five year old, you will very much appreciate this fact! The book is earmarked for ages 4-8 and I would say that is perfect. Each page has basic information about the animals (i.e. name, general height, weight, location, etc.) One thing I found particularly interesting about this book is that it also tells you what various groups of animals are called. For example, a whale group is called a pod, a group of pengiunes are called a colony and so on and so forth. The book's layout is very basic, simple and yet has enough text and information to keep a child entertained for some time. Bookworm1 spent several hours pouring over this title and I'm positive he'll do so again when it is returned to us. 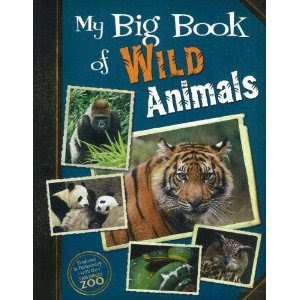 We highly recommend Big Book of Wild Animals ! As a special treat, the publisher, Ideals Books, has offered one copy of Big Book of Wild Animals to one of my readers here! In order to win simply leave a comment below. (Please include a valid e-mail address in your comment! If you do not, I will select another winner.) This contest is open to U.S. Residents only and will be open through Thursday, March 8th. THIS CONTEST IS NOW CLOSED. THE WINNER (as selected by Random.org) IS AMY @ A Faithful Journey! Congrats, Amy! Thank you, Ideals Books, for sending a copy of this book our way! We loved it! And thank you also for providing another copy for one of my readers! Oh, this does sound perfect for the young animal lover! We are still developing that love, but it is there! I'd love to win this!!!! This one looks FUN! Grasshopper loves his animals. I saw you on fb! Here's my second comment! Would love this book for my kiddos! Thanks! I'm sure our two boys would enjoy this book. My son would love this, and he has a birthday coming up! This sounds really great for my grandson! I know he would love it! My grandson would love learning about wild animals! Agree with others- sounds like a great book!! This would be loved at our house! Well, I'm sure MY resident animal lover would enjoy this book! This will be perfect for my young cousin Logan, a very big animal fan, who loves to have me read to him! This looks like an amazing book. I bet it has great pictures of the animals. I would love to win it. Thanks for having this giveaway.